It happened. 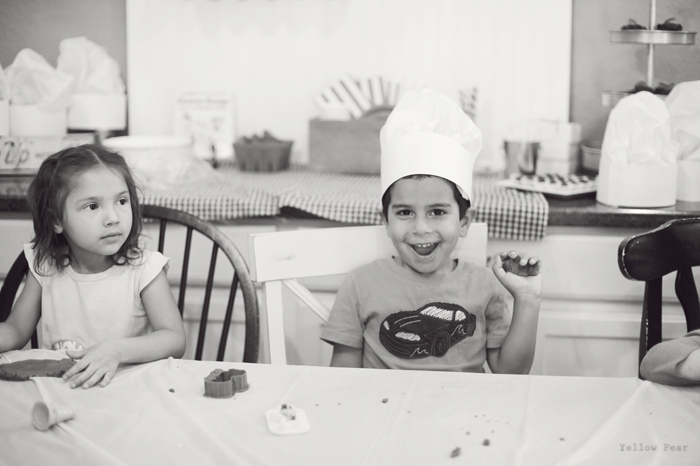 Q turned 5. He is (according to himself) so much wiser and helpful and grown up now. Also he thinks that he should be going to kindergarten. I have had the hardest time explaining how the cut off works... and that he needs to wait one more entire year. 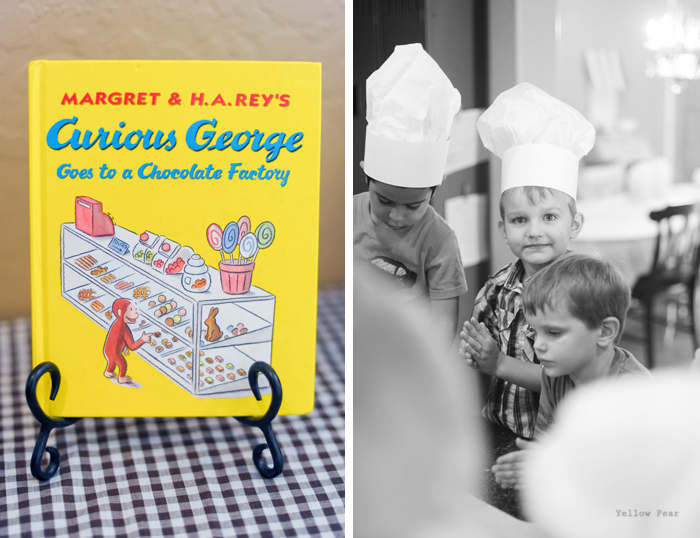 So, as I've mentioned before, Q really wishes to be a chocolate maker when he grows up...so we thought it would be fitting to have a Chocolate Factory Party centered around his most favorite Curious George book. 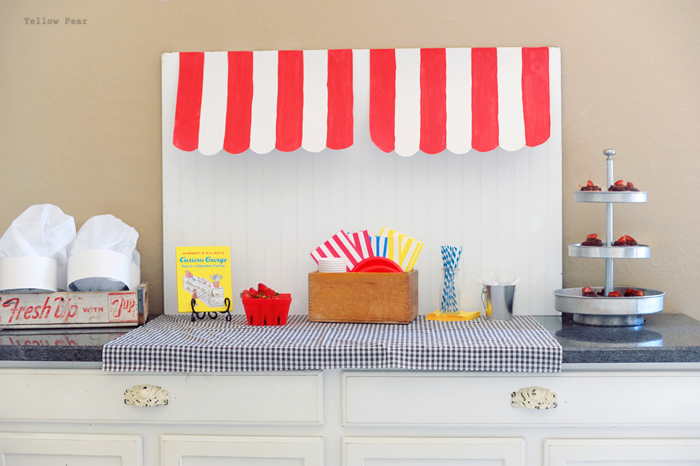 I made some easy candy shop-type striped awnings with poster board and red paint the morning of because I realized my decor was lacking. 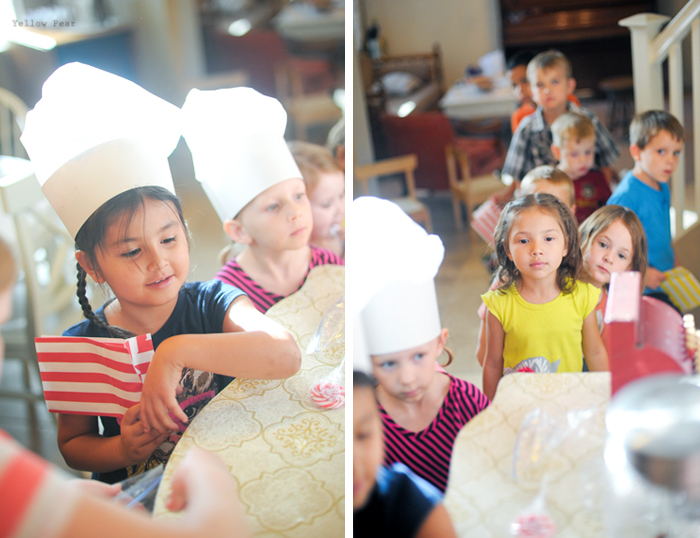 Mr. C and Q helped me make poster board and tissue paper chef hats for all of the many guests. I made chocolate cupcakes and set out strawberries (and added popcorn) to offset the copious amounts of chocolate/sugar they would be getting. 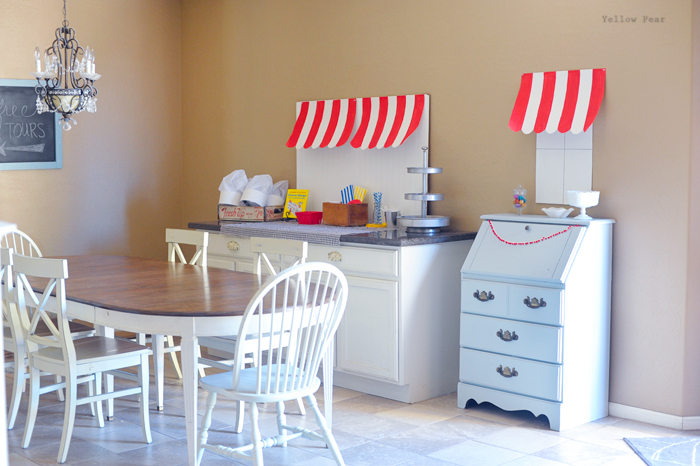 I found some awesome red, blue and yellow striped paper bags to hold all of their goodies. 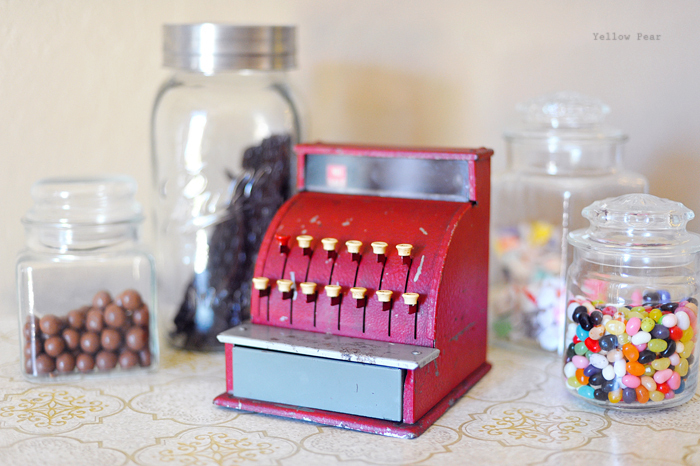 I HAD to find a red vintage toy cash register, just had to. There is one pictured in the book, and I thought it would be an awesome gift/prop/activity for the party. I found a perfect one on eBay and gave it to Q the morning of his party. He enjoyed it immensely. 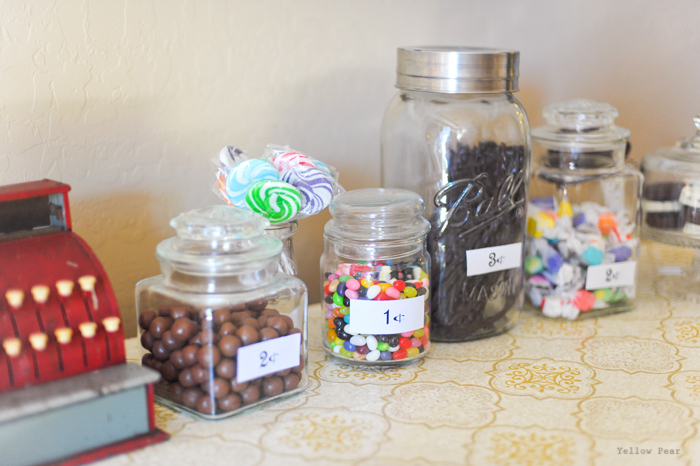 We used the cash register for our candy shop. 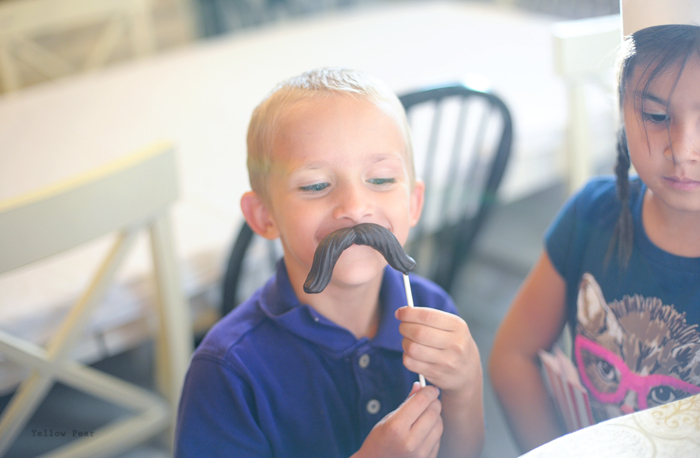 Q helped me pick out whoppers, chocolate licorice, jelly beans, salt water taffy, lollipops and then we made chocolate-covered mint Oreos (so yummy) and chocolate mustaches. 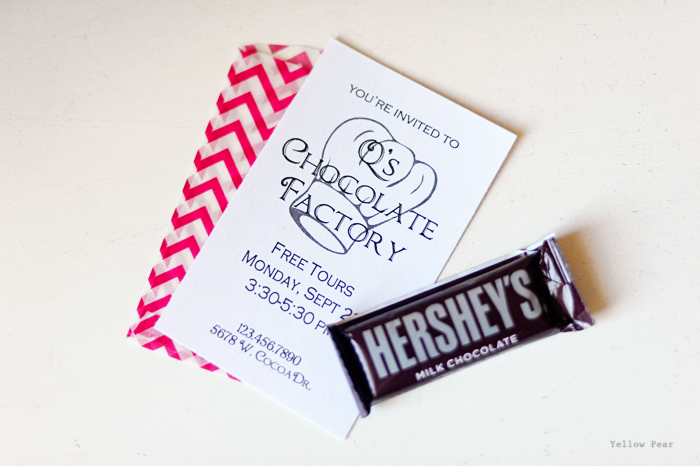 For invites, I printed off a simple card and slipped it in a red/white chevron bag along with a mini chocolate bar. 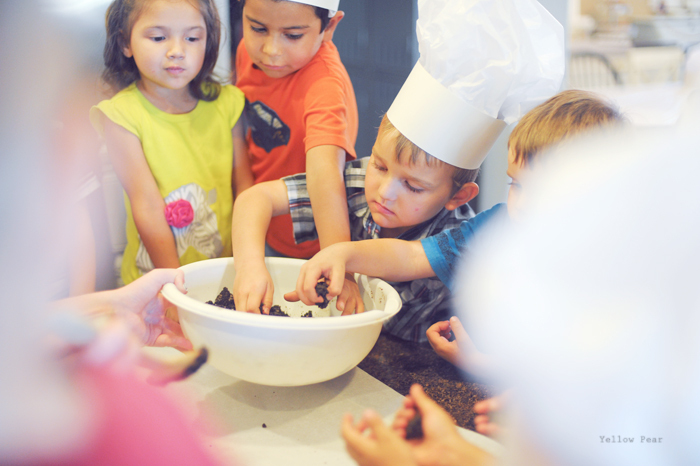 For our first activity, we ( Miss B and two friends helped out and were life-savers) gathered the kiddies around the kitchen counter to make Oreo Truffles. 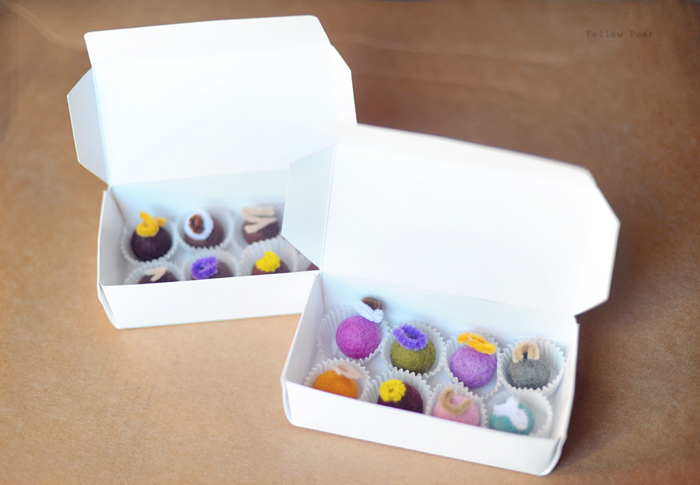 They took turns mixing and rolling truffles. While the truffles were put in to the refrigerator to set, we read the Curious George book. Next we set the kids up with Chocolate Play Dough and a bunch of cookie cutters. They LOVED it and played for quite awhile. The chocolate play dough is quite yummy so they ate as they played. And I ate some too. It is delicious. Now when we started this whole adventure, we wanted to make a chocolate factory. I thought and stewed and thought some more. How in the world was I going to make a factory that kids could play with and how could we incorporate chocolate? 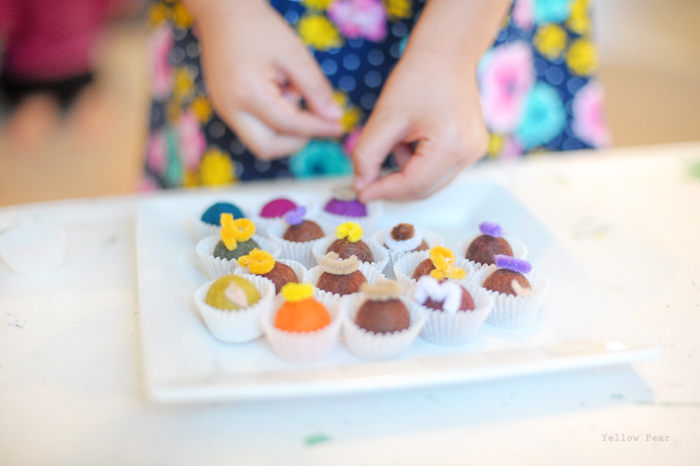 After talking to a friend, we came up with felted wool balls for pretend chocolate truffles. I bought chocolate brown ones from Etsy. And then one night the factory plans came to me. Miss B and Q helped me cut gift wrap tubes in half and glue them into empty boxes to make tracks. We made two factories. They can stack on top of each other for double tracks or be used separately. The brown chocolate balls are sent down the ramps and through the "factory". We spray-painted the factories silver and the kids painted on knobs and dials. And then we played with the factories for days leading up to the party...because they are such good fun. After the chocolates went through the factory, the kids were to put them in a candy liner and add a pipe-cleaner swirl or squiggle as per the books directions (thanks to my friend Tatum for the fun idea). Next they had to package them in candy boxes and deliver them. Half-way through the activity, Miss B realized we didn't have enough chocolates and added my other colorful felt balls to the mix and they worked awesome for colorful candies. After their hard "work" at the factory, we paid them with real money (a baggie of coins). 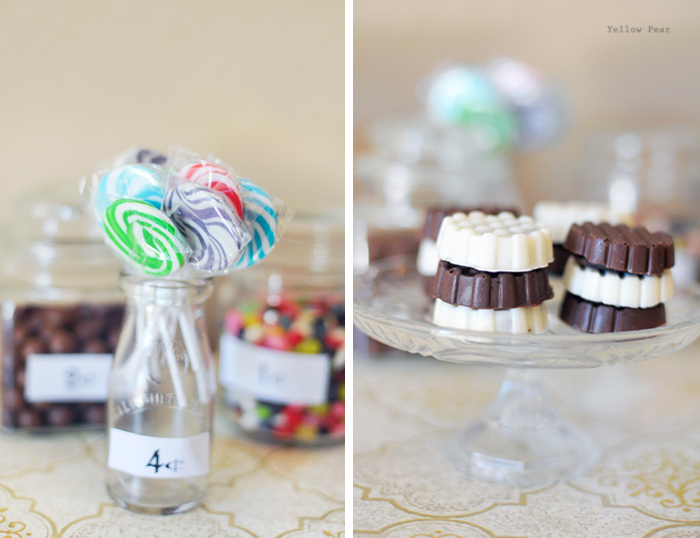 Then we opened our candy shop and accepted customers. Miss B and my two helpers ran the shop and the kids LOVED it. They thoughtfully looked at prices and how much money they had and chose very carefully. I couldn't believe how frugal and serious they were with their money. So it was awesome and a lot of fun to see the kids enjoy the activities. Q proclaimed it the best ever. 1. Place the chocolate frosting and the creamy peanut butter the bowl of a large stand mixer fitted with the paddle attachment. Mix on medium-low speed until combined. 2. Stop the mixer and add the powdered sugar, then turn the mixer to low. Mix until the sugar is completely incorporated, stopping periodically to scrape down the sides and bottom of the bowl and needed. 3. After mixing you should have a chocolate play dough that is soft enough to shape, but firm enough to hold its body--similar in texture to Play-Doh. If it seems to soft, you can add additional powdered sugar, if it is too stiff, you can knead in an extra spoonful or two of peanut butter. 4. You can use the chocolate play dough immediately or wrap it tightly in cling-wrap and store it at room temperature indefinitely. If necessary, knead before using to regain its malleable texture. 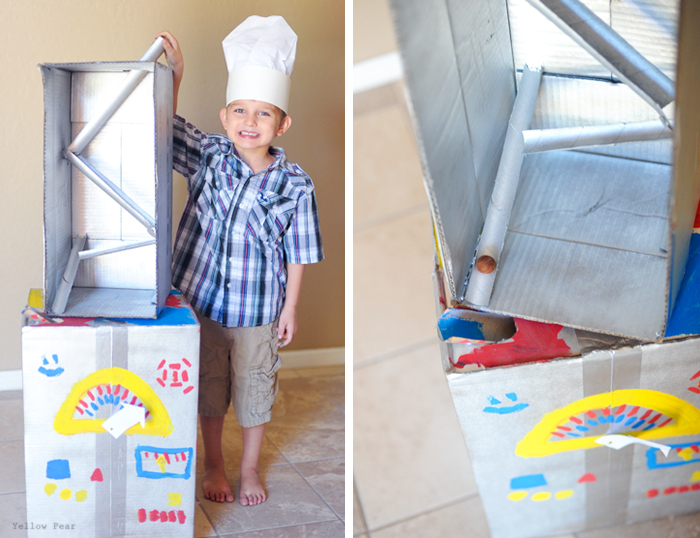 What an awesome party, very creative! 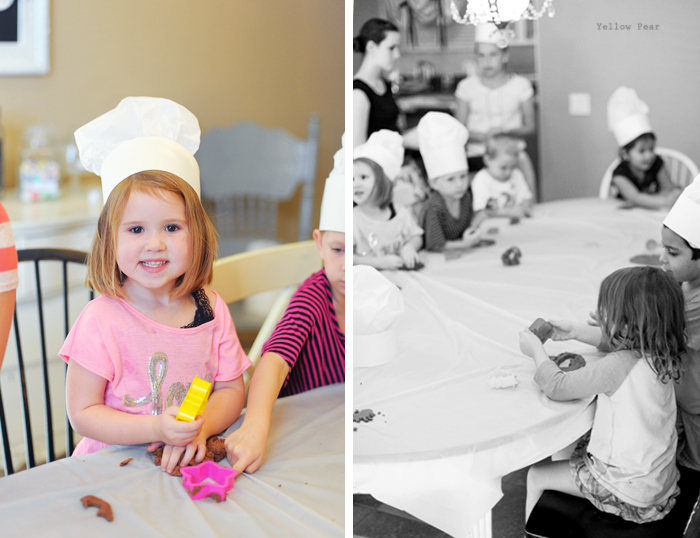 I love the chocolate play dough idea, I might have to try it!! 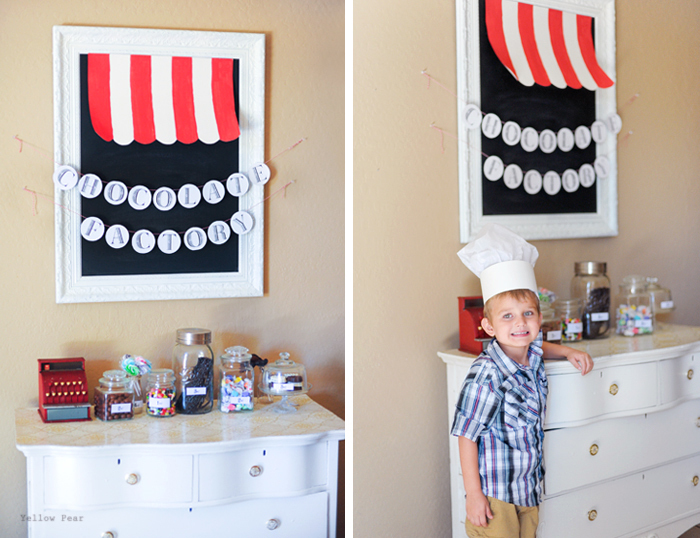 Love that they earned coins and could buy the candy. So cute. Very very cute! Lots of fun and lots of kids! Whew! Looks like a great party! The factory looks incredible! You've done it again Erika! Simply amazing!